Art Evolution turns twenty, and in so doing fades from this prestigious stage provided by Black Gate, but as the name contends, art is ever changing, and so I will never say never where the process and these articles are concerned. Still, if you’ve missed any of these wonderful works, the journey’s beginning can be found here. After the addition of last week’s ‘Demented Lyssa’, I’ll take a step back to the place where the true power of this article first struck me. 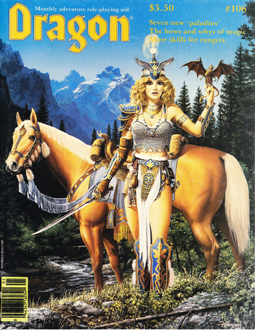 In late 2009 I’d just signed Larry Elmore and Wayne Reynolds, my spirits flying high as I spent my nights searching the web for artwork that might also apply to art evolution. It was during this process that a distinct sorrow assailed me in regards to the passing of Keith Parkinson. To me, Keith represented my youth, so many of his images galvanized in my mind along the way it was difficult to think of this article without him. For the first time I regarded this journey as a thing not involving me, but instead the artists, and the lives they’d touched along the way. Having heard so much about Keith from his fellows, I couldn’t help but feel that it would be selfish not to include him in the article because he couldn’t do a rendition of Lyssa. Lyssa was secondary to the art, after all, and the mission statement I now followed pushed for a thing greater than my ego. Steeled with this epiphany, I went to a website dedicated to Keith and found a place where you could send an email. I had no idea where the email went, but I placed a note anyway saying that I was doing an article on RPG art and that I’d like to be able to say a few words concerning Keith because of his impact on his friends, peers, and the industry who loved him. A few days later I got a message from Donna Parkinson, Keith’s widow, who stated that she’d spoken to Larry Elmore about this article and that she believed Keith would be very proud to be considered with the company I’d collected. She also asked what was required for inclusion. At this point I was kind of overcome, and I’m sure my response was a bit jumbled as I ended up sending her the very same basic tenants I gave all the other artists: young female wizardress, black hair, who always wears white trimmed in gold. Months passed and as 2010 came my thoughts moved forward as more evolution artists came into the fold, but always in the back of my mind I thought about Keith and Donna and what might become of her questions concerning participation. In February, I got a note from Donna that she and Nick, Keith’s eldest son, had found a piece Keith had done simply for himself, something extremely rare in the world of a professional full-time artist. As there was no other reason than the artist’s desire to create for this piece’s existence, it sat waiting until my requirement came in, and as I looked at it a feeling of profound fate swept over me. There stood Lyssa, the young female wizardress with her black hair and garbed in white trimmed in gold. Somehow, five years after he’d left the company of his fellows, he rejoined them again for a final shared project. I remember crying when I saw it, thinking of pictures and stories concerning Keith’s smile, his love of life and friends, the stories of amazingly intricate joke plots against fellow pit artists, nights drinking and throwing darts, and the strong sense of camaraderie he felt with all those he worked with. Keith had done it, he’d found a way, as though he somehow knew, so that he could ride one last time in the light with those he called friends. I wasn’t worthy of this, but I had to carry the torch nonetheless, the cause of Art Evolution now a kind of sacred tribute to the extended family that helped create this piece. However, I’m not the one to tell anyone about Keith as a person, and to that I’ll close this piece with something Timothy Truman, a fellow TSR pit alumni, wrote to me concerning Keith, something that I think gives another testament to a great artist and man. Parkinson was no stranger to acrylic but he primarily worked in oil throughout his career in a style he self titled ‘realism painted with a brush’. Yes, he was an ‘Oil Master’, one of the four originals who came into the revamped 1980’s TSR pit under the cause of taking out the comic book and putting in a truism to RPGs. He was a Dungeons & Dragons player himself, his love of the genre stemming from his deep appreciation for fantasy literature with names like Tolkien, Heinlein, and Herbert his favorites. In tribute to them, he spent his career building worlds to match the wordy passions of these literary masters. Keith plumbs a new depth in creation, his art taking shape around weight and texture. His paintings draw your hand to reach out and touch them, his exacting adherence to detail rising from the canvas in layered beauty. His armor is heavy, his clothing rich and tactile, and his landscapes jagged, course, or sinuous in the extreme. As Keith’s skill increased, so did his scope, and smaller pieces turned to larger works, the trademarks of his art revolving around three eye-catching subjects; magnificent gnarled trees, Hellenistic women, and vibrant dragons. Although adept in both fantasy and science fiction art, Keith is best recognized in his ability to capture worlds in unchallenged images of reality. In his various works, Keith might not have been given the chance to define a genre as did his contemporaries, but his individual contributions stand out like shining beacons among an otherwise black and white universe. 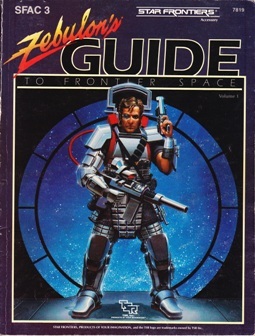 His rider on the cover of the Forgotten Realms boxed set makes threat of a horde approaching in the mists, while Star Frontiers transforms to something greater than space opera in our minds with the cover of Zebulon’s Guide to Frontier Space. 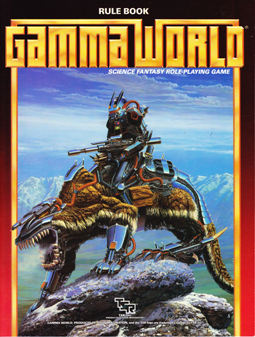 I personally see the mutant wolverine-cyborg and rider on Gamma World’s 3rd edition box as a kind of transcendence, almost screaming ‘this is the future, and you’d better grab your children’. All of these hold the viewer and demand we take note of the pages beneath. We believe in Parkinson’s creations, the sadness in the eyes of his ladies, the nobility and sly intelligence of his dragons, and the powerful roots of his forests. Keith created conviction. He mastered an artistic style above and beyond the pure fantasy of his peers. Keith may be gone, yet I believe his fans within the industry will forever remember him with pride for all he endeavored to create for them. His work transcends, it sings, and it is a lasting reminder to the unparalleled talent of the man who made it. These were a big part of my youth as well, I remember every one of those covers. What a fantastic talent. I’m so glad you wrote this series, Scott, and Keith’s presence is the jewel in the crown. I’m glad I ever got to meet him but wish I’d had the opportunity to get to know him. His work will always inspire me. Yes, yes, and more yes! Such a wonderful idea from start to finish. I remember Scott asking me about some of the artists I liked way back in 2008 for this idea he had and look at it now. I remember when that Forgotten Realms Box set came out with the Mongol Nomad on the cover and thinking one thing: this is definatley not the old DnD world of Oerth. There were other kinds of fantasy worlds out there, and Parkinson’s image stuck in my mind as a symbol for those other worlds could be, even though I’d rarely ever left Oerth. I remember hearing this story of how Scott found this piece and looking at the print in his mother’s house last March (an no, Scott does not live with his mother) and thinking the same things Scott said above. Sci-fi/Fantasy and gaming in particular have a way of transcending the individual consciounsess and touching on a collective experience that a group of gamers paricipate in, and Parkinson’s Lyssa, without impetus or need, provides us all a glimpse into that collective, magical world we all share when we game. And it is there that Keith lives on as one of the primal architects of that world: showing us all that characters and stories, imgaes and visions live on forever. Bill: Well its nice to know a BG blogger other than me actually reads my stuff! Funny as well that most of us BG guys and gals are the same age, so if we played D&D, then Keith should be a part of us all. Liz: Like so many of the artists I got the chance to work with, you have been so great in all this. Thanks for everything, and I’m glad you enjoyed Keith’s work, it was really a special piece. Bmblack: Hey, it only took 20 of these before you read them! Maybe there should be more blizzards in Indiana! You speak the truth, however, this is a very strong ‘family’ and it shows in how so many artists came together to help out. I’m seriously weeping here. What a perfect way to “end” the Art Evo series–though it, being evolution, can’t truly end. For this beyond the grave reach alone, this would be my favorite Lyssa–but there’s a dragon in it too, so that puts the whipped cream on top. Honestly, I don’t know that I could pick an absolute favorite. The art is SO diverse, despite the common subject matter. And it just goes to show that it’s no the subject matter that’s important, but what the artist (or writer!) does with it that counts. Witch: Thanks for always being there to comment. It was something special, all of it, and although I cursed the ride at times, I wouldn’t have given it up for the world. On Wednesday, October 26th, near 4:00pm PST, the artist Keith Arlin Parkinson passed away while surrounded by his loving family. Keith had been fighting Leukemia for over a year. He seemed to have it beaten, and even discussed attending Gen Con next year, but his Leukemia returned and his body couldn’t beat it again. Long before I started at TSR, I took note of Keith’s art. The art book “The Worlds of TSR” was in my reference library before I started the path that led me here, and Keith’s paintings were among the standouts. 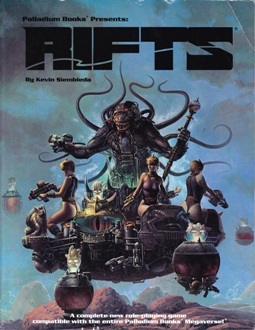 Together with Michael Whelan, Frank Frazetta, Brom, and Jeff Easley (in no particular order), Keith rounded out the top five fantasy artists who influenced my career, and in many ways also my art, outright. One day in my first month at TSR, I was studying one of my favorite reference books, the art of Frank C. McCarthy, a western artist whose compositions and landscapes always pleased me. Paul Jaquays, another TSR staff artist at the time, saw my interest and said “That’s interesting; Keith Parkinson always had that book open, too”. I knew he was right instantly, of course. I could see the influence clearly once it was made apparent; in King’s Gold, for example, or Orcs in the Snow. I always felt that Keith and I had similar artistic sensibilities. His art collection Knightsbridge: The Art of Keith Parkinson is one of the most-visited in my reference collection. When he left TSR and started doing book covers for the New York publishers, he only blossomed further. In his short years, his impact – on gaming and the D&D worlds, to the many excellent covers in “mainstream” publishing, to his visionary work in video games, most notably EverQuest – is gigantic. 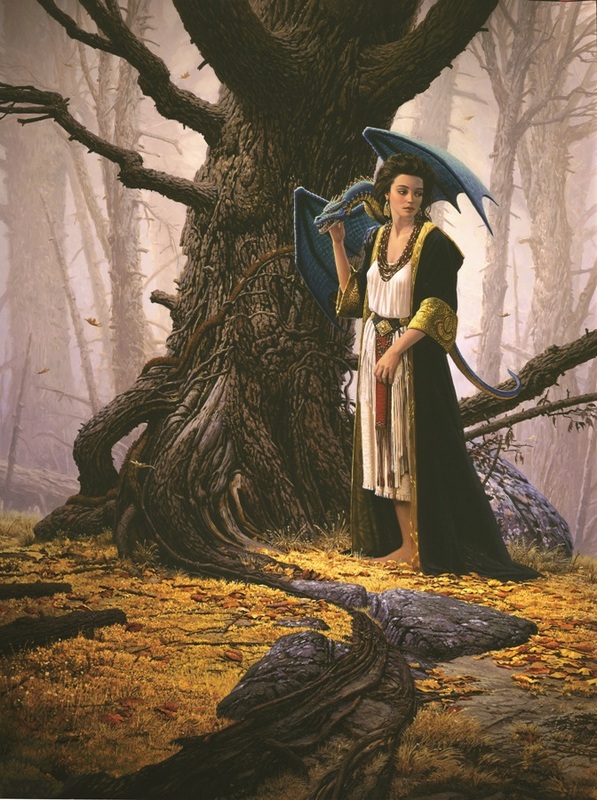 His sense of story and composition were keen, his dragons were among my very favorites, such as the dramatic lava dweller in Fire Sea, the spectral white in Hand of Chaos, or the blue in Ice Dragon. He painted some of the best armor, as well; see The Sapphire Rose, The Shining Ones, or The Lost Prince. He had a love for trees, which was apparent in the care he took in painting them.You can see it in paintings like Chernevog or Arcane Summons. His landscapes were everything from minimalist perfection, as in North Watch, to Bierstadt-like granduer, as in Greeting the Dawn. You can still find new nuggets, mostly hidden, such as in concept art done for various game worlds like Vanguard. All in all, a complete artist. I only met Keith on two occasions, but I found him to be open, interested, and very intelligent. We wrote a few times, but I always expected I would have other opportunities to get to know him better. I am saddened that now I will only know him through the remembrance of his friends, and through his wonderful art. Perhaps that is how all artists would want to be remembered. Thank you, Keith, for the gift of your inspiration. Todd: A great piece, thanks for sharing it. Keith certainly found a way to impact a great deal of lives. I was told by Nick that although his father never would choose a favorite piece, Chernevog was something he always went back to and spoke of. I think it’s great you mentioned it. Nicely done. A moving tribute, and an excellent cap to an excellent series. HAJ: Thanks, I’m very happy BG thought they were good enough to run. It’s been a pleasure. Thanks for this great piece. I don’t think I realized just how many of the iconic F/SF images of my youth were Parkinson’s creations. Saladin: Thanks for the comment. You know, as I wrote this and spoke to people I found so many of them remembered pictures, not artists. They identified with a particular piece that they’d purchased in youth, or played at a friends, or based a campaign on. I’m glad I got a chance to introduce so many people to the artists that helped create those memories. Well, I’ve just gone back through all the posts and I’m impressed by (and obscenely jealous of) the collection of illustrations of Lyssa you managed to collect. Elmore, Caldwell, Dee, etc, etc, etc! I’ve got a novel coming out from DAW next year and recently had a conversation with my editor about what I’d like the cover to look like – and other than maybe Wheelan, you’ve got every name that came out of my mouth here in this series! The essays do a great job of contextualizing each artist as well. Made my afternoon! Saladin: Whelan is a VERY tough nut to crack, [not David Trampier tough, but still hard] and he’s only done 3 RPG covers that I’m aware of, all for GURPS between 1987-90. Even getting an interview with the guy has vexed me, but rest assured I’ve tried, just for the love of art if nothing else. I’m currently reading Bradbury’s Martian Chronicles with a Whelan cover. Man, he really can kick it [Whelan, not Bradbury ]. Good luck getting him, it would be awesome for your book. And man, if you just read them all, I’d guess that did take the afternoon! Thanks for giving me a look. I missed my chance to speak at Keith’s memorial at Gen-Con 2005 (by turning up at the wrong venue. Standing around thinking… where is everyone??? )So I’m going to say here what I would have said then. Keith Parkinson’s artwork has been a source of inspiration and joy to look at. From the dramatic brooding majesty of Strahd the Vampire from the cover of Castle Ravenloft (D&D I6) to the inclusion of a tardis hidden on the shelves in The last spell of Fistandtilus. These images in particular had a profound effect on me in my youth and continue to do so. His awesome talent will be missed. Thanks for the art evo series Scott. I went back to part 1 and re-read them all, and I must say, great series. Amazingly ambitious project you embarked upon and what a success!